Laura awakens at the bottom of a staircase, not knowing how she got there. There is no one to call for help, and she is snowed-in. Laura, while exploring the house for answers, comes across a small room underneath the basement. She steps inside– and ends up in another place. For years, the fantasy genre has enraptured many a reader. Whether sci-fi or medieval fantasy, the genre has made a large impact on the world of literature. J.S. 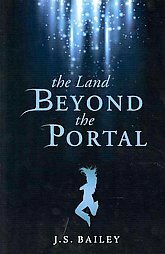 baily delivers a light, fun adventure in her first novel, The Land Beyond the Portal. Portal came across to me as a story geared towards the young adult crowd, though some adults surely would like it as well. There are some things that I would like to have seen more in the book. One would be the world-building. It was fine for what it was, but I would have liked a map in the front or the back of the book so that I could see the layout of where the village of Sparkling Falls and a particular house are located. Maps have helped readers connect with the world which they are reading about, such as the maps of Tolkien’s Middle Earth, C.S. Lewis’ Narnia, or Christopher Paolini’s Alagaesia. This would have been helpful, but I got through reading the novel without too much trouble. When writing a fantasy novel, an author may have a difficult time with creativity. This is not the case with this book, though. Bailey has proven to be able to create something that is different than fantasy novels of the past. The twist that is revealed in the second half of the novel surprised me and drove me to keep reading. Portal is a nice, light read that takes you out of the normal fantasy genre, and keeps you reading. Note: A copy of this book was given to me in exchange for an honest review from the publisher. All thoughts and opinions are mine. Great review! Sounded forthright and honest. Cannot wait to read your book!